Prototype: Different Mercedes Benz automobiles. 200 - 280 E (W114 / W115) sedan, 250 C - 280 CE (C114) coupe, 280 S - 450 SE (W116) sedan, 280 SLC - 500 SLC (C107) coupe. Model: The automobile models come with detailed metal bodies and many details picked out in color. Each type of automobile comes in 5 different, authentic paint schemes. The automobiles come individually packaged, each package individually marked. 00771-01 W114/115 length 55 mm / 2-3/16". 00771-02 C114 length 55 mm / 2-3/16". 00771-03 W116 length 58 mm / 2-5/16". 00771-04 C107 length 55 mm / 2-3/16". Scale automobile models with metal bodies. Refined details: tail lights, pin stripes, type badges, and more. Each type of automobile in different colors. One-time series for the theme "Auto Plant"
Prototype: Different Mercedes Benz vehicles. Type O302 bus. Type L2624 heavy-duty, short-hood truck. Type L311 light-duty, short-hood truck. Type U406 Unimog tractor. Model: These commercial vehicles come with metal components, detailed bodies, and many details picked out in color. Each type of vehicle comes in different, authentic paint schemes. All of the vehicles come individually packaged, each package individually marked. 00772-01 O302 length 126 mm / 4-15/16". 00772-02 L2624 length 94 mm / 3-11/16". 00772-03 L311 length 91 mm / 3-9/16". 00772-04 U406 length 50 mm / 1-15/16". Scale commercial vehicle models with metal components. Prototype: VTG, Inc. (former Vereinigte Tanklager und Transportmittel GmbH / United Tank Farm and Transport Services, Inc.) class 201 small diesel locomotive. Former German Federal Railroad (DB) Köf II / class 323. Version with an enclosed cab. 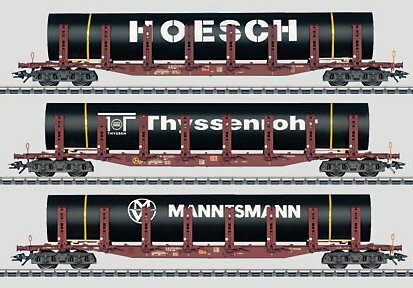 2 petroleum oil tank cars, used on the German Railroad, Inc. (DB AG). Model: The locomotive comes with a digital decoder. It has a controlled, miniature motor with a flywheel. 2 axles powered. 2 track adhesion magnets for greater pulling power. The headlights and marker lights will work in conventional operation and can be controlled digitally. The acceleration and braking delay can be controlled with the 6021 Control Unit or Märklin Systems. The locomotive has separately applied grab irons. The tank cars come with detailed trucks and partially open frames. The platforms and ladders are separately applied. The trucks are based on the type Y25. The cars have different car numbers. Total length over the buffers 43.7 cm / 17-3/16". Special magnets provide more pulling power on Marklin track. Maintenance-free LED's for white headlights / red marker lights. The VTG Köf. In the Nineties, Vereinigte Tanklager und Transportmittel GmbH / United Tank Farm and Transport Services, Inc. acquired three class 323 small locomotives that had been retired from the DB. The successor firm VTG Lehnkering sold two locomotives in 1998 and 2000 and bought a Köf again in 2002 that had already been used by a toy manufacturer in industrial work after its service on the DB. The present VTG, Inc. uses the two remaining locomotives at the Syke-Barrien car plant (near Bremen). Prototype: German Federal Railroad (DB) class V 36. Road numbers 402 and 403 as permanently coupled units in M.U. operation. Used for light freight and passenger trains on branch lines. Model: One locomotive comes with an mfx digital decoder and controlled high-efficiency propulsion; the other locomotive (dummy unit) comes with a sound effects generator. 3 axles powered. Traction tires. The headlights at the outer ends of the locomotive will work in conventional operation and can be controlled digitally. Diesel locomotive operating sounds and a horn as well as acceleration and braking delay can be controlled with a 6021 Control Unit or with Märklin Systems. The sounds of the oil pump and squealing brakes can be controlled with Märklin Systems. The locomotive has many separately applied details. Total length over the buffers 21.6 cm / 8-7/16". The Tiny Twins. After the Second World War, the V 36 was practically the only mass-produced diesel locomotive available to the new DB and the East German DR. Around 120 of these units built from 1937 to 1944 were still in existence and the DB had another 30 locomotives built from the same designs. They were used in switching work and on transfer routes. These locomotives produced 360 horsepower and could be upgraded to the medium power class for road operation with light passenger or freight trains. A simple form of M.U. operation back to back was included in the design of the V 36. Both cabs were accessible by means of crossover doors, and direct communication between them was possible. At that time two-man operation was the rule anyway with this locomotive class; in operation as pairs the workplaces were separated by the buffer beams. The mechanical connection of the throttles for both locomotives and control from one cab was possible in a limited way. The novel by Erich Kästner in 1949 gave the double locomotive its nickname in German "Doppelte Lottchen" or "Double Lotte" (in English, an approximate equivalent is "Tiny Twins"). The option of m.u. operation was used again and again until finally the compact V 100 was available in sufficient quantities. Today, two museum locomotives sometimes meet to form a special attraction – the "Tiny Twins". The 48810 6-Car set is the perfect accompaniment for this locomotive set. Prototype: German Federal Railroad (DB) class 103.1 express locomotive. Regular production version with double rows of side vents, smooth external walls, end skirting, large windshield wipers, and double-arm pantographs. Model: The locomotive comes with an mfx digital decoder, controlled high-efficiency propulsion, light and sound functions. 3 axles powered. Traction tires. The headlights and marker lights will work in conventional operation and can be controlled digitally. The engine room lighting, a horn sound, as well as the acceleration and braking delay can be controlled with a 6021 Control Unit or with Märklin Systems. The headlights, marker lights and engine room light are maintenance-free LED's. The engineer's cabs have interior details. The locomotive has 18 individually applied grab irons. The roof has equipment details. The open end skirt and close coupler can be replaced by a closed skirt with plug-in brake hoses and a prototypical coupler. Length over the buffers 21.9 cm / 8-5/8". Anniversary model for "50 Years of the Trans Europe Express"
Prototype: German State Railroad Company (DRG) class 50. Version with a box-style tender and Wagner smoke deflectors. Model: The locomotive comes with an mfx digital decoder, controlled high-efficiency propulsion, a Telex coupler on the tender, and a sound effects generator. The motor is in the boiler. 5 axles powered. Traction tires. The locomotive frame is articulated to enable the unit to negotiate sharp curves. The headlights will work in conventional operation and can be controlled digitally. A 7226 generator can be installed in the locomotive. The smoke generator contact, the Telex coupler, steam locomotive operating sounds, as well as the acceleration and braking delay can be controlled with a 6021 Control Unit or with Märklin Systems. Additional operating sounds can be controlled with Märklin Systems. The pilot truck has a close coupler in an NEM coupler pocket. There is an adjustable close coupling between the locomotive and the tender. Length over the buffers 26.3 cm / 26.5 cm / 10-3/8" / 10-7/16". Telex coupler on the tender for remote controlled uncoupling of cars. When "Heinrich" / "Henry" was still smaller ... Coal is a bulk freight that has traditionally been conveyed by rail. In the Thirties it was domestic coal that had to be transported from the coalfields in Germany. To the extent that the areas of demand were not on the major main lines, the axle loads for transport on branch lines were limited. For that reason small, short freight cars were used for a long time – similar to in England – that spread the load over many axles. This meant that the black gold could be brought with trans-loading from the sidings for the coal mine to the industrial siding at the boiler house or to the siding for the fuel dealer. Typical for these cars were the car types "Schwerin" and "Nürnberg" with a load limit each of 15 metric tons. Around 40,000 of these cars were available for use on the DRG around 1930. The locomotives had to fulfill corresponding requirements for this work: powerful motive power with a low axle load. This was exactly the design of the class 50 as a lightweight freight locomotive. With an axle load of 15 metric tons and 5 powered axles, this locomotive reached a starting tractive effort of around 16 metric tons (160 kilonewtons). On flat terrain it could confidently master a typical heavy coal train with 30 cars and 700 metric tons. The track network had to be expanded first before the "Lange Heinrich" / "Long Henry" could grow to its full size: load capacity, block length, and safety equipment were not sufficient for a 4,000 metric ton train until the DB era. The coal cars from the 46045 10-car set and the TRIX T24105 5-car set make up an appropriate train for the former German State Railroad class 50. Prototype: German Federal Railroad (DB) class V 90 heavy switch engine. Locomotive as it was first delivered. Model: The locomotive comes with an mfx digital decoder, Telex couplers, and controlled, high-efficiency Soft-drive Sine propulsion. The locomotive has a compact-design, maintenance-free motor with a flywheel, centrally mounted. 4 axles powered through cardan shafts. Traction tires. The headlights / marker lights are maintenance-free LED's. The headlights / marker lights will work in conventional operation and can be controlled digitally. The Telex couplers as well as the acceleration and braking delay can be controlled with a 6021 Control Unit or with Märklin Systems. The engineer's cab has interior details in relief. The locomotive has separately applied metal grab irons and hand rails. The steps to the engineer's cab can be removed for small radius curves. Length over the buffers 16.4 cm / 6-7/16". Telex couplers for remote controlled uncoupling of cars. Prototype: Siemens Dispolok, Inc. class ES 64 F4 fast general-purpose locomotive, used on the German Railroad, Inc. (DB AG). Multiple system locomotive with 4 pantographs. Use: Cross border fast freight trains. Model: The locomotive comes with an mfx digital decoder, controlled, high-efficiency Softdrive Sine propulsion, and a sound effects generator. The locomotive has a compact-design motor. 2 axles powered. Traction tires. The headlights / marker lights are maintenance-free LED's; they will work in conventional operation and can be controlled digitally. The white long distance headlights and a horn sound effect as well as the acceleration and braking delay can be controlled with a 6021 Control Unit or with Märklin Systems. The engineer's cabs have interior details. The locomotive has separately applied metal grab irons. Length over the buffers 22.5 cm / 8-7/8". White LED's for regular and long distance headlights. Prototype: German State Railroad Company (DRG) type O 11 short, high side gondola. Association design, "Nürnberg" type. Model: 10 cars of which 4 cars have brakeman's cabs or brakeman's platforms. The cars have different car numbers. The car bodies are weathered. The cars have load inserts with a layer of real coal. Total length over the buffers 80.0 cm / 31-1/2". Succinct. The "Schwerin" and "Nürnberg" gondolas were built in large numbers starting about 1910 for the State Railroad Freight Car Association and then later for the German State Railroad. The superstructure built of steel and the short chassis made these cars very sturdy and allowed a full load even with heavy bulk freight. Many of these cars with an almost toy-like look were acquired by the German Federal Railroad after 1945. Era II: the right coal train to go with the 37849 model of the class 50. Add onto this set with the TRIX T24105 5-car set as well. Prototype: German Railroad, Inc. (DB AG) type Kbs 443. Version without a hand brake. Used to transport large pipe. Model: The stakes can be mounted on the car. The load of industrial pipe is secured with a special wood frame. Length over the buffers 15.7 cm / 6-3/16". Prototype: German Railroad, Inc. (DB AG) type Kbs 443. Version without a hand brake. Used to transport a transformer. Model: The stakes can be mounted on the car. The transformer load is secured with a special wood frame. Length over the buffers 15.7 cm / 6-3/16". Prototype: German Railroad, Inc. (DB AG) type Snps 719 double stake car. Used to transport pipeline pipe from different manufacturers. Model: The cars have detailed, permanently mounted stakes. They also have different car numbers. Each car comes loaded with a large, lettered pipe. All of the cars come individually packaged and the packaging is marked. Total length over the buffers 72.0 cm / 28-3/8". Prototype: German Federal Railroad (DB) type Lbgjs 598 universal flat car for medium and large containers. Type Efkr "pa" containers for fine bulk freight and foodstuffs. Magirus truck with a special trailer. Model: The car comes with high-impact buffer beams and separately applied grab irons. The car is loaded with 5 removable containers painted and lettered for "Südzucker". The containers have separately applied details and different registration numbers. Length over the buffers 17.0 cm / 6-11/16". The truck model has a metal superstructure and trailer. Prototype: German Federal Railroad (DB) type Sammp 705 flat car. Used to transport machinery and large subassemblies. Model: This car comes loaded with a corner flange pipe in a suitable load frame. Stakes and load beams are included. Length over the buffers 15.2 cm / 6". DC wheel set 6 x 700580. Prototype: Different freight car types from the German railroads in the postwar period (DR Brit./US Zone, DB, SWDE and privately owned). Type Pwg 41 freight train baggage car. Type Om 12 gondola. Type Z tank car for heating oil. Type G 10 insulated brewery refrigerator car. Type Gr 20 boxcar. Type G 10 boxcar. Model: The baggage car has a flat roof. The gondola has a load insert. The tank car is painted and lettered for DEA. The beer car is painted and lettered for Kulmbacher. Both boxcars have sliding doors that can be opened. Total length over the buffers 66.8 cm / 26-5/16". All of the cars come individually packaged and the packaging is marked. On the Way to the DB ... The operating association of the Southwest German Railways (SWDE) managed the state railways in the French Occupation Zone from 1947 to 1949. The states of Rheinland-Pfalz (Rhenish-Palatinate), Südbaden (South Baden), and Württemberg-Hohenzollern introduced the railroad districts of Karlsruhe, Mainz, and Trier (as a substitute for Saarbrücken); the general administration was headquartered in Speyer. The German Federal Railroad originated from the railroads of the British-American Bi-Zone (Brit./US Zone) as early as 1949 of course; the SWDE was not fully incorporated into the DB until 1952. DC wheel sets: 6 x 700580, 4 x 700270, 2 x 32 3760 04. A good train to go with the 37355 double diesel locomotive. General introduction to electricity. 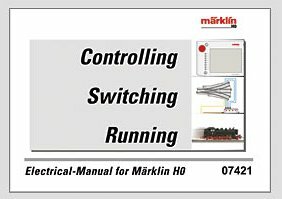 Fundamentals of wiring for connections on conventionally powered layouts as well as for layouts controlled digitally with the 6021 controller, etc., and layouts controlled with Märklin Systems. Controlling turnouts. Examples of manual, semi-automatic, and fully automatic operations for layouts controlled with analog, digital, or with Märklin Systems. Operation of working models such as the crane, coaling station, turntable, transfer table, etc. Numerous examples of applications and circuits. Functional test of components. Format 26.4 x 22 cm / 10-3/8" x 8-11/16". Hardbound. The contents are the same as the 07420 German edition. 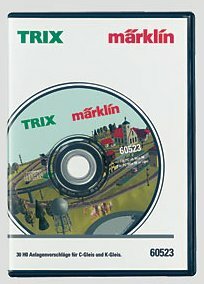 CD ROM with 30 suggestions worked out for Märklin H0 model railroad layouts. Track plans are shown for C Track and for K Track as well as 3-dimensional views of the layouts. A viewer program is included on the CD ROM to show layouts and views directly. The track plans can be edited and stored with the 60521 track planning program. German language version only. System requirements: Windows 98/ME/2000/XP. Pentium processor or a comparable processor, CD ROM drive. Graphics card with 16 Bit color shades. 32 MB main memory (RAM). The track plan book in a CD format. 30 suggested layouts in 3-D.
Viewer included for showing the layout plans. Can be used with the 60521 track planning program. These track plans are compatible with the modellplan Wintrack family of track planning software. These springs are for the 73400 or 73401 lighting kits in conjunction with the 72020 current-conducting couplers. This is a set with 5 ground springs for installation in the car trucks. Universal circuit board with several white LED's to fit in most of the passenger cars in the Märklin H0 program. One 73401 board is required for a short car (example: Langenschwalbach cars); two boards are required for long cars (example: UIC-x cars with a length of 28.2 cm / 11-1/8" length). Several of these circuit boards can be plugged together or a board can be shortened. Mounting hardware is included. Depending on the car type, the separate pickup shoe / ground spring set, item nos. 73404, 73405 or 73406 or the 72020 current conducting couplers with the 72050 ground spring is required for electrical connections. A bright light in the cars: white LED's. The 73400 lighting kit (softer light for earlier eras) and the 73401 lighting kit (white light for more modern cars) are technically interchangeable. A 73404, 73405 or 73406 pickup shoe / ground spring set or the 72020 current conducting couplers with the 72050 ground spring are also required for the 73401 lighting kit. Prototype: Stationary heating smokestack with a supporting girder framework and a work platform. For using operational locomotives as heating locomotives and sources of steam. Model: The station is a lattice bridge structure with all components made of metal. Completely assembled, detailed model ready for installation over the track. Height 140 mm / 5-1/2”. Clearance about 60 mm / 2-3/8”. Prototype: Lattice mast of steel construction with a cross member and 2 doubled suspension insulators. Model: The lattice mast is constructed of metal. The insulators are made of plastic and have eyelets (0.8 mm / 1/32”) for carrying a thread as a high voltage line. Height 266 mm / 10-1/2", width 122 mm / 4-13/16", base 35 x 35 mm / 1-3/8" x 1-3/8". 562 x 92 cm / 222" x 37"
Prototype: German Federal Railroad (DB) type Kklm low side car. Fictitious design for Christmas. Model: The car has a frame with truss rods. The body is designed as a lantern housing in a festive decoration with colored ornament windows. LED's are used for lighting and a pickup shoe mounted to pick up power. Length over the buffers 11.5 cm / 4-1/2". Lantern housing with a real wood surface. Window panes decorated wit historic themes. Model: The car is an old-timer decorated with a Christmas theme. The theme shows a nostalgic winter scene. Length over the buffers 40 mm / 1-9/16". Prototype: German Federal Railroad (DB) class 044 heavy freight locomotive. Version with open front skirting and Witte smoke deflectors. Model: The frame, locomotive body, and the tender are constructed mostly of metal. The locomotive has an mfx digital decoder, controlled high-efficiency propulsion, and a sound effects generator with several functions. The locomotive can be operated with DC power, AC power, Märklin Delta, Märklin Digital or Märklin Systems. 5 axles powered. The locomotive has a built-in smoke generator. The triple headlights change over with the direction of travel. The running gear lights are maintenance-free LED's. The lights and the smoke generator will work in conventional operation and can be controlled digitally. The steam locomotive operating sounds, the whistle sound, and the Telex couplers can be controlled with a 6021 Control Unit or Märklin Systems. The acceleration and braking delay as well as other operating sounds can be controlled with Märklin Systems. The engineer's cab has interior details. The locomotive has many separately applied details. The minimum radius for operation is 1,020 mm / 40-3/16". Length over the buffers 71.0 cm / 27-15/16". The class 44 with its five driving axles is one of Europe's most powerful steam locomotives, and is rightly considered to be the symbol of the standard design freight locomotive. The mighty exhaust from the three cylinder running gear fascinated several generations of railroad enthusiasts, who nicknamed the 44 "Jumbo". The class 44 was built over a period of at least 23 years at production facilities in Germany and countries occupied during the war. It started in 1926 with 10 prototypes. Initially, they had to take a backseat to the class 43 two-cylinder 2-10-0 units. The locomotive committee was under the mistaken notion that they didn’t need the somewhat more maintenance-intensive locomotive with the additional cylinder. As train loads and speeds grew, the time had come for the well-designed class 44, which was fast and smooth-running for its time. Scheduled delivery of the class 44 ended in 1944. The plant at Hennigsdorf built ten additional units in 1949 from existing parts. A total of 1,989 locomotives were built and they differ in numerous details, which should not be surprising, given the long production period. After the war both German state railroads modernized a portion of their motive power pool. In the west the class 44 was in service until the end of the steam locomotive era, 1977. In East Germany the end came late in 1981. 58358 -- Set with 5 Hopper Cars for "Lange Heinrich" / "Long Henry"
Prototype: German Federal Railroad (DB) type Fad 168 high-capacity hopper car. Used for unit trains in mass freight service with coal, coke, and ore.
Model: The load hatches can moved sideways to open them. The cars have load inserts with real iron ore. The car bodies are weathered. The minimum radius for operation is 1,020 mm / 40-3/16". Length over the buffers for one car 37.0 cm / 14-9/16", for all of the cars together 190.0 cm / 74-13/16". "Lange Heinrich" / "Long Henry". Embedded in the Northwest German plains area is the Emsland area, a region rich in bodies of water and moors. At the start of the Seventies until the end of steam locomotive operation on the DB in October of 1977, it became the Mecca for railroad enthusiasts from all over the world. The last steam giants on the German Federal Railroad ran with passenger trains to Norddeich Mole, and heavy freight trains were in operation between Emden and the large industrial centers on the Rhine and Ruhr. The star on the Emsland line was the "Lange Heinrich" / "Long Henry", a 4,000 metric ton ore train between the Emden switch yard and Rheine, always with two of the last great freight locomotives from the classes 042, 043, and 044 as motive power. The high-capacity hopper cars were loaded with imported raw material in Emden's outer harbor and were hauled by steam and diesel locomotives to the switch yard and there were assembled into long unit trains of 2,000 and 4,000 metric tons. The power output of one of the powerful locomotives was just enough to bring the load for the 2,000 metric ton trains over the lightly ascending line onto the mostly flat 140 km / 88 mile route to Rheine. The "Lange Heinrich" trains were twice as heavy and required the use of two locomotives, which got underway after a furious start, often with slipping wheels. The trains usually had oil-fired class 043 locomotives from the Emden and Rheine Districts as motive power. The classes 042 and 043 were often used in combination, occasionally two of the class 042, and quite rarely the last of the coal-fired class 044 helped along with the other two classes. The classes 042 and 043 had been equipped for oil firing during an overhaul and had entered the motive power roster at Rheine in 1967. There were many locations along the route for taking impressive train photographs. A favorite among knowledgeable photographers was a bridge at Aschendorf, south of Papenburg. The trains could be photographed in almost their entire length on a curve leading to the right. Even more ideal and probably the best place in the Ems area was south of Lathen. There, the route ran between two sand dunes in a curve to the left and offered an unobstructed view of a complete 4,000 metric ton train under the best lighting conditions. A requirement was of course good weather, exact knowledge of the schedule for the trains, and being there early in the morning, when the sun was still low on the horizon. Long before the train entered this section of the route, a distant column of smoke and the unmistakable rhythm of the exhaust announced its approach. The waiting was then rewarded with an unforgettable view of the entire consist from the front of the locomotive to the end of the train consisting of fifty cars. (From notes by Horst J. Obermayer). 58359 -- Set with 5 Hopper Cars for "Lange Heinrich" / "Long Henry"
Model: The load hatches on the cars can be moved sideways to open them. The cars have load inserts with real iron ore. The car bodies are weathered. The minimum radius for operation is 1,020 mm / 40-3/16". Length over the buffers for one car 37.0 cm / 14-9/16", for all of the cars together 190.0 cm / 74-13/16". With the 58358 and 58359 car sets, you have available a total of 10 ore cars in authentic paint and lettering with different car numbers. The prototypical motive power for this "Lange Heinrich" / "Long Henry" is the powerful 55441 model of the class 044 from Rheine. 59934 -- 1 Gauge Roller Test Stand with 8 Pairs of Roller Brackets. The large test stand for the large locomotives: class 01, class 44, and class 96. Prototype: Class ER 20 diesel locomotive and 3 updated passenger cars for the "Allgäu Express" as a joint project of the Bavarian Provincial Railroad (Regental Railroad, Inc.) and the Swiss firm EuroTHURBO, Inc. (SBB). Type Am compartment car, 1st class, type Bm compartment car, 2nd class, and type BRDpm open seating car, 2nd class with a bistro area. Model: The locomotive has a die-cast metal frame and body. It has a built-in digital decoder for DCC, Selectrix, and Trix Systems, and it can also be run conventionally. 4 axles powered. 2 traction tires. The triple headlights are maintenance-free LED's and they change over with the direction of travel. The cars have NEM coupler pockets and close coupler mechanisms. Train length 1,029 mm / 40-1/2". Here Comes "alex" ... The Allgäu Express is a modern concept for regional express passenger service in the alpine foothills. This train closes gaps in the passenger network that are no longer served since the discontinuation of the InterRegio trains. Powerful locomotives, updated cars, and trained personnel offer punctuality, comfort, and service – features the "alex" is using in the travel market to establish its image. The 36848 locomotive and the 42953 car set from Märklin are available for "alex" trains on 3-rail AC layouts. Prototype: Ruhr Coal, Inc. (RAG) switch engine, road no. D-727. Former class 80 on the German Federal Railroad. Built in 1927. Use: Switching work at mine complexes and transfer of cars to the rail network. The locomotive looks as it did around 1970. Model: The locomotive has a die-cast metal frame and body. It has an 8-pin NEM connector for digital decoders. The locomotive has a powerful 5-pole motor. 3 axles powered. Traction tires. The headlights are white LED's, they will work in conventional operation, and can be controlled digitally after a decoder has been installed. The Heusinger valve gear is reproduced on the model. The locomotive has many separately applied details. It has NEM coupler pockets with a close coupler mechanism. Length over the buffers 111 mm / 4-3/8". RAG Time. The DB retired 17 units of its class 80 in the mid-Sixties, all of which were stationed in Schweinfurt. These locomotives were not even 40 years old and were in good condition. They were sold to industrial companies and mining firms. Seven of the former class 80 were in service until 1974 at Ruhr Coal, Inc. (RAG). DB No. RAG No. 80 013 D-721 80 014 D-722 80 030 D-723 80 036 D-724 80 037 D-725 80 038 D-726 80 039 D-727 A number of museum locomotives still in existence came from this roster. Prototype: Swiss Federal Railways (SBB/CFF/FFS) class Ae 8/14. Road no. 11801 with 2 pantographs in an experimental "machinery green" paint scheme. Era III. Model: The locomotive has die-cast metal frames and bodies. It has an NEM (M) digital connector. The locomotive has two powerful motors. 4 axles powered. Traction tires. The frame is in two parts to enable the locomotive to negotiate sharp curves. There is a permanent drawbar between the two halves of the locomotive. The headlights and marker light will work in conventional operation and can be controlled digitally after a decoder has been installed. The locomotive has 2 pantographs with double wipers. The engineer's cabs have interior details. The locomotive has NEM coupler pockets. Length over the buffers 391 mm / 15-3/8". Prototype: Swiss Federal Railways (SBB/CFF/FFS) class Be 6/8III, 2-6-6-2 wheel arrangement, built starting in 1926 (Ce 6/8III). Nicknamed "Crocodile". Use: Heavy freight trains. Model: The locomotive has a die-cast metal frame and body. It has an NEM digital connector. 3 axles powered. Traction tires. The locomotive has NEM coupler pockets. The locomotive has the Swiss headlight code and the headlights change over with the direction of travel. Length over the buffers 230 mm / 9-1/16". Prototype: Swiss Federal Railways (SBB/CFF/FFS) class De 6/6. Nicknamed "Seetal Crocodile". Use: Freight and passenger trains on branch lines. The locomotive looks as it did around 1953. Model: The locomotive has a die-cast metal frame and body. It has a connector for digital decoders. The locomotive has a 5-pole motor with a flywheel, centrally mounted. 6 axles powered. Traction tires. The locomotive has an articulated frame to enable it to negotiate sharp curves. The headlights and the Swiss marker light are LED's. The locomotive has separately applied metal grab irons. Brake hoses and prototypical couplers can be mounted on the buffer beam. The locomotive has NEM coupler pockets. Length over the buffers 162 mm. Prototype: Early German Federal Railroad (DB) type O 11 short gondolas. "Nürnberg" Association designs, used to transport coal. Era IIIa. Model: 5 cars, of which one each has a brakeman's cab or a brakeman's platform. The cars have different car numbers and lettering. They have load inserts with a layer of real coal. The cars are weathered to represent traces of coal dust. They have close coupler mechanisms and NEM coupler pockets. Total set length 399 mm / 15-11/16". 700150 (Märklin) AC wheel set. This set can be added to the T24069 set for a realistic unit train of 10 cars. The same 10 models in an AC version can be found in the Märklin assortment under item no. 46030 as well as the new Marklin 10-car set 46045. Prototype: German Federal Railroad (DB) type Fc 090 dump cars. Model: Each car has a different car number. The cars have finely detailed construction with numerous separately applied details. The chute extensions on the cars are separately applied. The inner surface of the car body is set off in a different color. The cars have close coupler mechanisms. Total length over the buffers 340 mm / 13-3/8”. Each car comes individually packaged and the packaging is marked. Another car set with the type Fc is available from Märklin as item no. 46310. Prototype: German State Railroad (DRG) Langenschwalbach design branch line cars. 3rd production run starting in 1907. One each type C4itr Pr 14 coach, 3rd class with a baggage area, type C4i Pr 15, 3rd class, type BC4i Pr 14, 2nd and 3rd class, as well as a type PwPost4i Pr 14 baggage car. Era II. Model: The passenger cars have open, closed or mixed vestibules. The mail-baggage car has closed vestibules. The trucks are specific to these cars. The cars have separately applied grab irons and walkover plates. The cars have a representation of gas lighting. They also have older design open buffers. The cars have close coupler mechanisms. Total length over the buffers 608 mm / 23-15/16". Each car comes individually packaged and the packaging is marked. The Langenschwalbach train with different car numbers is offered by Märklin under item no. 43047. Prototype: German Federal Railroad (DB) type Snps 719 double stake car. Era IV. Model: Both cars come loaded with real wood. The cars have finely detailed, permanently mounted double stakes with tensioning levers. The load surface is set off in a different color. The cars have brake wheels. They also have close coupler mechanisms. Total length over the buffers 479 mm / 18-7/8". Each car comes individually packaged and the packaging is marked. This track extension set can be used to expand the track layout for all starter sets. It can be used for parallel track connections, passing sidings, a storage siding, and new routes. This track extension set is suitable for TRIX starter sets as well as for existing layouts. It can be expanded with the entire C Track program. Contents: 7 each no. 62172 straight track, 171.6 mm / 6-3/4" 7 each no. 62188 straight track, 188.3 mm / 7-13/32" 3 each no. 62224 curved track, R 2 / 24° 8 each no. 62230 curved track, R 2 / 30° 2 each no. 62611 left turnout, 24° 1 each no. 62612 right turnout, 24° 1 each no. 62671 left curved turnout, 30° 1 each no. 62672 right curved turnout, 30° 1 each no. 62977 track bumper, 80.5 mm / 3-3/16"
The 74490 electric turnout mechanism from Märklin can be installed in the turnouts. Prototype: Zollverein Coal Mine in Essen. Built starting in 1929/30. Eras II-V.
Model: This is a challenging kit requiring about 70-80 hours of time to build it. The buildings are designed in a modular fashion; the individual lattice framework segments and window elements can be combined in different ways as required. Detailed, multiple language instructions for building this kit are included. The base for the total complex is about 800 x 650 mm / 31-1/2" x 25-9/16". Height of the conveyor tower: approximately 490 mm / 19-5/16". Part 1 of the kit includes the shaft hall and the conveyor tower. These kits are being produced in a limited edition. Good Luck, Zollverein Coal Mine! The Zollverein is considered one of the most beautiful mines in the Ruhr area. And if that is so, then it is the most beautiful mine in the world. The Zollverein Foundation has therefore made great efforts to have the Zollverein cultural landscape put at the top of the list of suggestions for the UNESCO World Cultural Heritage. The two architects Fritz Schupp and Martin Kremmer were inspired by the Bauhaus movement. They used the principles of symmetry and geometry in a consistent, harmonious fashion to design this industrial complex arranged in two axes. 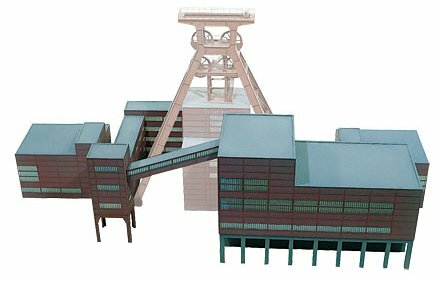 Their design for the Zollverein Shaft XII is a unique model layout. 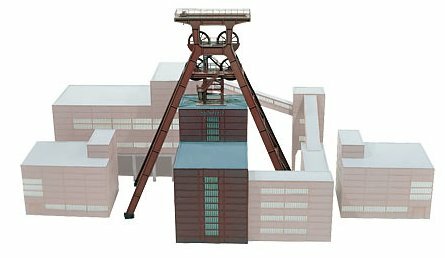 Model: Part 2 of the kit contains the two conveyor machinery buildings, the conveyor band bunker tower, the car turnaround, two diagonal band bridges, and the coal washer. 2 universal circuit boards with several white LED's to fit in most of the four-axle passenger cars in the TRIX H0 program. Both boards can be plugged into one another or shortened, depending on the length of the car. Mounting hardware is included. Two pickup springs for electrical connections. The 66718 lighting kit (white light for more modern cars) and the 66719 lighting kit (softer light for earlier eras) are technically interchangeable. This lighting kit fits in the new generation passenger cars with a length over the buffers of 282 mm / 11-1/8". Fits in all version of the "Schürzenwagen" / skirted passenger cars, Langenschwalbach, and Swiss lightweight steel cars. Prototype: Salzburg Railroad Transport Logistics (SETG) log transport. Mittelweser Railroad (MWB) class 1116 "Taurus" electric locomotive in the wood chips design. 3 Swiss Federal Railways (SBB) type Snps double stake cars. Era V.
Model: The locomotive has an NEM digital connector. It has a motor with 2 flywheels. 4 axles powered. Traction tires. The pantographs will work mechanically and electrically. The locomotive has a close coupler mechanism. The cars come with a load of real wood. They have different car numbers. Total train length 522 mm / 20-9/16". Wood Chips from the Bull ... The Salzburg firm SETG specializes in transport in the wood and lumber industry and other bulk freight. Wood material in processing stages between logs and wood chips are brought long distances from the manufacturing site to additional applications. The focal points are in Germany, Austria, and Switzerland. The powerful "Taurus" electric locomotive is leased from the Mittelweser Railroad and very visibly demonstrates with its wood chips design the industry in which the railroad is active. Prototype: German State Railroad Company (DRG) class 01 express locomotive. First production run of the standard design locomotive starting in 1925. 4-6-2 wheel arrangement, version with an older design boiler, small Wagner smoke deflectors, gas lighting and type 2´2´T32 riveted tender. Original green paint scheme. Era II. Use: Express and fast passenger trains. Model: The locomotive has an NEM digital connector. The motor and gear drive are in the tender, and the motor has a flywheel. 4 axles powered. The tender is constructed of die-cast metal. The smoke box door can be opened. There is a close coupling between the locomotive and the tender. There is an NEM close coupler pocket on the end of the tender. Length over the buffers 150 mm / 5-7/8". In the Beginning It Was Green ... The first standard design locomotive from the German State Railroad's comprehensive concept was the class 01 that was built starting in 1925. At that time it looked a bit more quaint than what we know today: older design boiler, small Wagner smoke deflectors, riveted tender with a raised superstructure, and gas lighting. The early paint scheme for this German State Railroad express locomotive borrowed greatly from the Prussian paint scheme of the provincial railroad period: The basic color was green, the wheels and the frame were dark red, and only a few small parts were black. Retrofit kit for brakeman’s steps, rail guards, and coupler on the front of the locomotive with a pocket included. The train contemporary to the class 01 consists of Group 28 cars: item no. 15710. Prototype: German Federal Railroad (DB) type Uai 839 heavy transport car. Built in 1973. Era IV. Use: Very heavy, specialized transport. Model: The car has 32 axles, "Schnabel" load arms, and a die-cast metal transformer as a load. The car has many separately applied details. The load arms can be coupled directly to one another without a load. The car has close coupler mechanisms at the ends. Length over the buffers 391 mm / 15-3/8". Notes about operation: This car can be used on curves with a radius of R1 194.6 mm / 7-11/16" or greater; we recommend larger curves. Signals, catenary, bridge railings, tunnel portals, etc. must be mounted far enough from curves due to the overhang of the long the "Schnabel" load arms. Your track must be mounted sturdily in place for the considerable weight of this car. Prototype: "metronom" Railroad Company, Inc. commuter cars, 2nd class. These cars are the same as the German Railroad, Inc. (DB AG) type DBz 750. Use: Regional express trains. Era V.
Model: The cars have different car numbers. They also have close coupler mechanisms. Total length over the buffers 335 mm / 13-3/16". These two reserve cars are available for increased passenger loads on the "metronom" train 11609. Prototype: Express train consisting of Group 28 cars: 2 type C4ü-28 cars, 3rd class, 1 type AB4ü-28 car, 1st and 2nd class, 1 type WR4ü-29 dining car. The cars look as they did when delivered around 1928. Era II. Model: The cars have new individual car numbers. The cars are ready for installation of lighting kits. The cars have close coupler mechanisms. Total train length 558 mm / 21-15/16". Each car comes individually packaged, and the packaging is marked. The class 01 as it looked when delivered, item no. 12310, is the right locomotive to go with the Group 28 cars as they looked when new from the builder.